I'm excited to be starting something new on my blog this year. I have been accepted as a member of The Old Schoolhouse Review Crew! The Old Schoolhouse is a quarterly homeschool magazine that started in 2001. It's available in print, online, or mobile app. Yearly Membership. I admit, at first I wasn't thrilled. I prefer our children to spend more time outside than in front of a screen. They learn computer skills so incredibly fast, I don't feel a need at all for them to spend much time on it at all. Brought to you by Teresa Evans, a veteran classroom teacher in Australia, Everyday Games is a fun and interesting way to teach math and phonics. Her math games will help your student improve without realizing he is really “doing math.” The reading games practice many skills, such as consonant blends, suffixes, prefixes, compound words, and much more. One of the best ways to encourage your student to learn is by helping them have fun, and you can do that with Everyday Games. The best part for me is the “Go to today’s game!" link. Something different is available each day. The two youngest had fun with a dice game. I actually gave them two different pages for the different levels they are and had them play it like Bingo, with dice instead of Bingo numbers. Each number on the die has a list of unfinished words they have to come up with a letter or blend to finish. Once they got all the words in one number line, they won a line. They really enjoyed it and even helped each other come up with words. They kept track of which line each won but they both won some, so it was awesome to see them work together with a competitive fun that didn't go overboard. It didn't take a lot of time for me. The older children would even stop as they walked by the table and help give hints. All we had to do was print out a few pages and find the dice. Everyday Games was definitely a hit with our family! Our oldest boy's favorite part is the Computer & Technology section. He has been reading the “Internet Entrepreneurship for Teens”. I was thrilled to see some comprehensive High School Courses like this! The children are also thoroughly enjoying the Media Library. A gateway to more than 10,000 video resources for you and your family. The media library includes resources for all ages, from VeggieTales, Adventures in Odyssey, 3-2-1 Penguins, and What’s In the Bible for kids to Bible studies by Francis Chan, John MacArthur, Dave Ramsey, and John Maxwell for adults. It also includes academic content that you’ll find described below. It is a streaming video site, and there is no limit to the number of videos you can enjoy. Most videos are available worldwide (a very small number have geographic restrictions). Plus additional resources for organization, record keeping, encouragement, free monthly e-books... I could go on and on. This is honestly a resource we are considering investing in again. The membership of $12.95 each month or $139 yearly seems well worth all that is available. If this sounds like something that would fit your family, check out this great coupon!!! I received a free copy of this product through the Schoolhouse Review Crew in exchange for my honest review. I was not required to write a positive review, nor was I compensated in any other way. All opinions I have expressed are my own or those of my family. I am disclosing this in accordance with FTC Regulations. I am so happy to hear that your mom was able to see your achievements and i an very sorry for your loss. The variety of the materials on their site is astonishing! It's really easy to get lost with all the options. I enjoyed reading how you use it with your family. Congrats on being a Homeschool Crew blog member this year. Sounds like fun! Looking forward to your reviews. 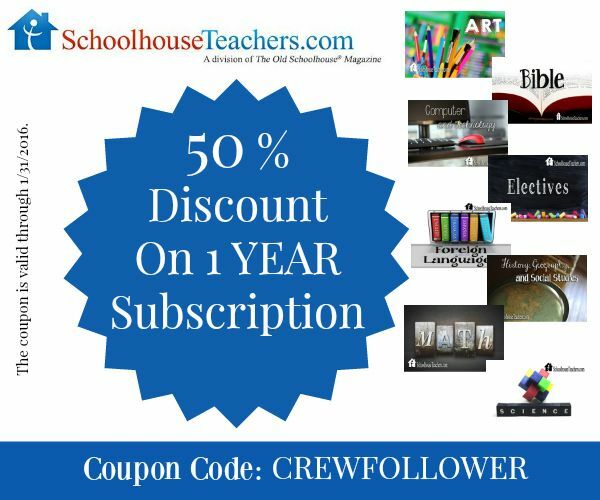 I never heard of "SchoolhouseTeachers.com" but just looked into it after reading your review. I think my favourite part would be the media library, that would be really cool to have that available.